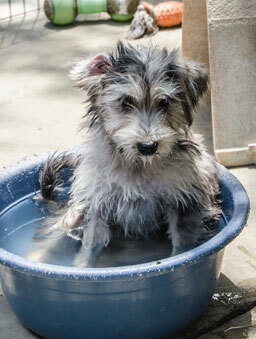 Trusty, a puppy born to a pregnant Schnauzer mix we rescued, using his water bowl to cool off in the hot Palmdale summer sun. CMSR is qualified with the IRS as a 501(c)(3) charity. Donations qualify for tax deductions as charitable contributions. CMSR's federal ID number is 90-0722858. CMSR checks out adopters to make sure that we are placing our dogs in homes where they will be loved and well cared-for. We require prospective adopters to complete an Adoption Application and we do home visits whenever feasible. There is a link to the Adoption Application in the last paragraph of the description of each dog. We frequently need foster homes for Miniature Schnauzers and similar dogs pending their placement in permanent homes. If you are in northern California, please email Mary Alford at schnauzer@dslextreme.com. If you are in southern California, please email John Hoffman at cmsr@johnehoffman.us. Rescue is expensive! Vet bills are by far our biggest expense, but there are also shelter pull fees, gas for trips to pick up dogs from shelters, and other expenses as well. We try to save older dogs and dogs with medical problems because they are the least likely to make it out of shelters alive, but rescuing them is much more expensive than rescuing young, healthy dogs. Send funds by Paypal to canada@dslextreme.com. (Please check the "Family and Friends" box. That way, Paypal will not deduct a transaction fee. Amazon Smile—Help CMSR when you shop on Amazon! CMSR is honored to have been awarded an Adoption Options in Action grant award from Petfinder in October 2016. We thank Petfinder very much for recognizing our efforts to save as many dogs as we can and to get them into great new homes. Thanks very much also to Ryan and Nicole Birdsall for alerting us to the opportunity to apply for the grant and for preparing the grant application—as well as all their help in fostering and transporting dogs. We are very grateful to have you as active participants in CMSR. CMSR is proud to participate in the Shelter Pets Count initiative which was kindly funded by Maddie's Fund. The Shelter Pets Count initiative was designed (a) to provide better information on the number of homeless pets passing through shelters and rescues and the numbers returned to owner, adopted and euthanized, and (b) to encourage shelters and rescues to make their disposition numbers available to the public. CMSR's numbers for 2016, along with less detailed information for prior years, can be found on our new Dispositions page. CMSR would like to extend a huge thank you to Hope For Paws. Hope For Paws has helped us rescue many dogs with broken legs and broken pelvises by paying for the surgeries on Bailey, Mia, Owen, Dory, Dickens, Sam, and Obi-Wan, among others. In addition, Hope for Paws paid the medical expenses on Bella, Bowie, and others for whom they asked our help in finding homes. A donation to Hope For Paws will help them help more animals in need.